A freshman House Democrat apparently violated prohibitions on members of Congress participating in initial public offerings, according to a report from legislative research service LegiStorm. 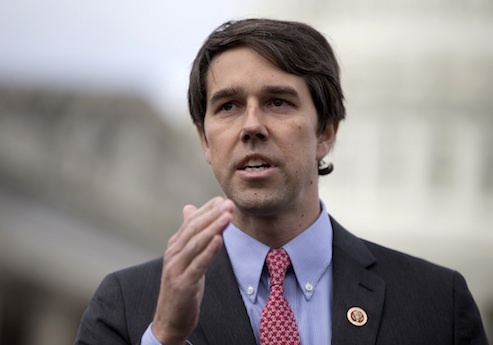 Rep. Robert Francis "Beto" O’Rourke (D., Texas) has participated in seven IPOs since taking office in January, LegiStorm reported, an apparent violation of the Stop Trading on Congressional Knowledge (STOCK) Act. "O'Rourke saw a 39 percent increase on the shares that he sold either the same day or within days of the IPO," LegiStorm reported. After LegiStorm reached out to his office, O'Rourke immediately reported himself to the House Ethics Committee. The freshman lawmaker bought seven stocks at the fixed IPO prices, including Twitter, 58 COM Inc., Surgical Care Affiliates, Third Point Reinsurance, Phillips 66 Partners LP, RetailMeNot Inc. and Noodles Inc. He made $4,800 in profit on the shares he sold, according to O'Rourke's letter to the Ethics Committee. Additionally he has kept some other shares which would earn him nearly $2,400 in additional profit – a 36 percent overall return – if sold at today's opening prices. O'Rourke said in his letter that he did not direct his broker to make any of the purchases and "none of the purchases were made on our behalf because of my position." He said he has "instructed our broker to stop any further transactions." The House Ethics Committee recently warned members about participating in IPOs, noting that the STOCK Act "prohibits Members, officers, and employees who file [financial disclosure] statements from participating in IPOs in a manner ‘other than is available to members of the public generally.’"